This is the fifth in this series of products. 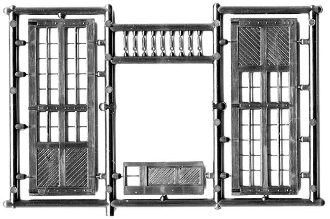 The "Shop Door" package includes (3) "sprues". These exquisitely detailed doors can be added to almost any existing engine house or railroad shop building. Complete with tiny hinges which slip over a piece of .020" wire for realistic operation. These doors can also be creatively modified "Kit Bashed" into regular doors and windows simply by cutting them into sections. Also these doors (and windows) can be added to a painted or printed background on your shelf layout for realism beyond most average shelf layout projects. Included in this package are, 3 each left and right doors with hinges and 3 optional employee doors.